This document describes the features of ClinCapture Studio 2.3. You access ClinCapture Studio at https://studio.clincapture.com using a web browser. For a list of supported web browsers, consult Supported Browsers in section 1.5. 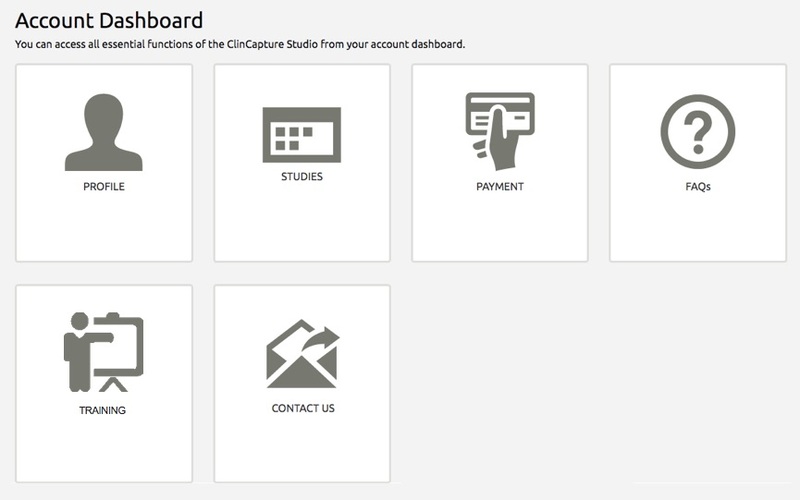 This document is intended for study administrators who will use ClinCapture Studio to design and build studies. After the Introduction, Key Concepts, and Getting Started sections, the Building Your First Study section explains the ClinCapture Studio Guided Tour, which walks you step-by-step to build your first study. After you’ve built your first study, this document is organized according to the tasks you can perform in ClinCapture Studio, including maintaining your account, managing studies, designing CRFs in Form Studio, deploying, and sharing your study. Additionally, information is provided at the end of the document to explain where to get support and how to view FAQs for answers to commonly asked questions. User Roles Blue, underlined font indicates a hyperlink inside this document, or on the web. Forgot Password Light blue, underlined font indicates a hyperlink inside the ClinCapture Studio system. Submit Bold font indicates verbatim text from ClinCapture Studio, often used to identify a button, icon, text or field. Home Italics font indicates a webpage, document name, or provides emphasis. This section introduces the key concepts embodied in ClinCapture Studio, presents a typical study build workflow, and describes the user interface and functionality. ClinCapture Studio is a Web application available at: https://studio.clincapture.com. This application allows you to build studies and create CRFs using Form Studio, a drag-and-drop graphical user interface. From the login page below, click Create an account. Complete the following form. Required fields are marked with a red asterisk. First Name * Type your first name. Last Name * Type your last name. Work Email * Type a valid corporate email address. Personal emails are not accepted. Read the ClinCapture terms of service and privacy policies. They can be printed if needed. Check your email inbox. You will receive a registration confirmation email from ClinCapture. This email contains a link to activate your account. Click the Activate Account link in your registration email. Complete your profile. Required fields are marked with a red asterisk. 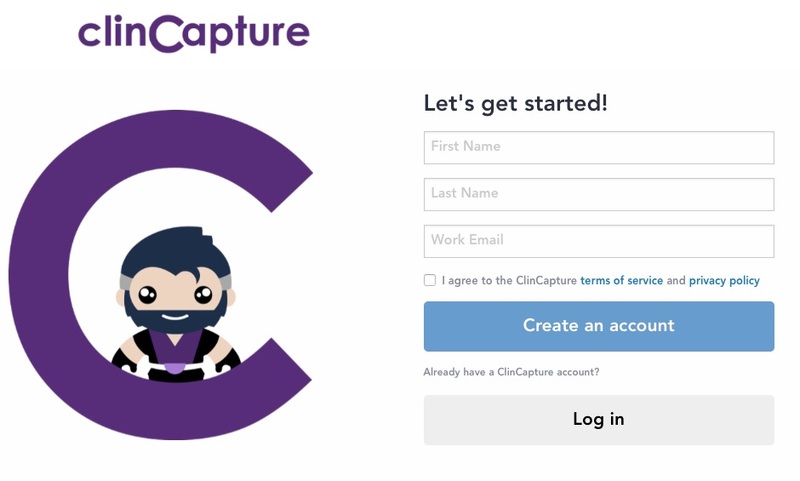 Username * ClinCapture Studio will suggest a unique username. It can be changed, if necessary. Password * Enter a password with at least 8 characters. Re-enter Password * Re-enter the same password. First Name * This field is populated from your registration form. It can be changed, if necessary. Last Name * This field is populated from your registration form. It can be changed, if necessary. Primary Email * This field is populated from your registration form. It cannot be changed. Job Title * Enter your job title. Company * Your company name. International Phone Number * Enter a telephone number where you can be reached directly. The following character types are allowed: Numbers, Space, Parentheses ( ), and Dash -. Phone extensions are not supported. A valid phone number is required to verify your account. We will send you a PIN code, either via SMS or voice message, to validate the phone number. Address Line 1 Your business address. Address Line 2 A second line is provided for your business address, if necessary. City The city in which your business is located. State / Province / Region The state/province/region in which your business is located. ZIP / Postal Code The ZIP or postal code for your business. Country The country in which your business is located. Time Zone Select your time zone. Guided Tour Determines if the guided tour is Enabled or Disabled. Your account is activated upon a successful save. 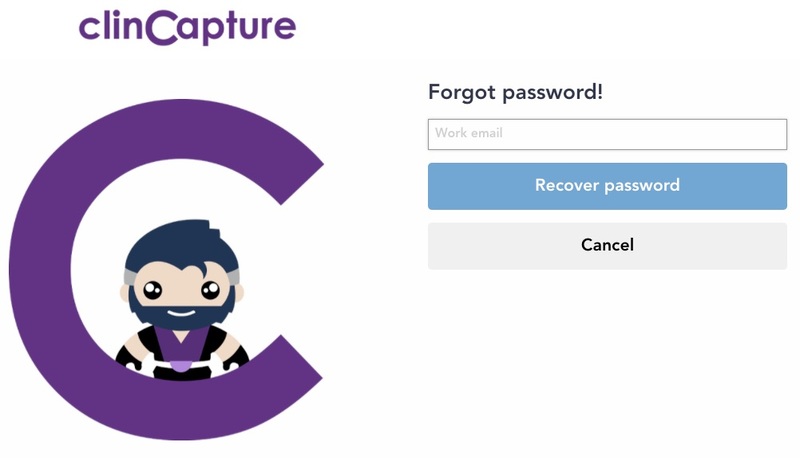 You will need valid login credentials to use ClinCapture Studio. 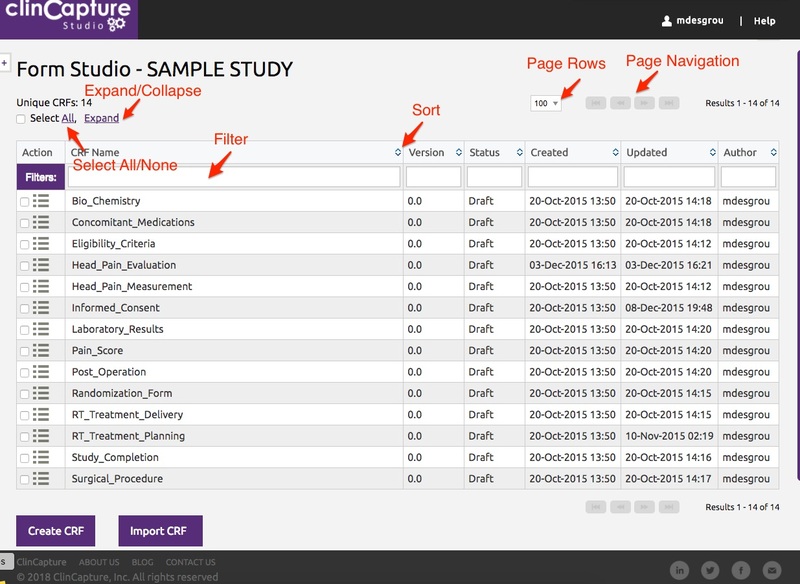 The same credentials can also be used in Captivate once you deploy a study. Point your browser to https://studio.clincapture.com. From the login screen, type your username and password. Hover over your username in the header and select Logout. You can recover your lost password by clicking the Forgot Password? link on the login page. Enter your email address in the next screen and click Recover password. An email containing a link to create a new password will be sent to you. After a period of inactivity, Studio prompts you to keep the session active. If you do not respond, your session will time-out and you will be logged out. If you were designing a form when the session timed out, when you return, you are given the option to resume your previous session in Form Studio. If you decide to resume your session, you will be returned to the CRF design page from where you were timed out. Otherwise, you will be directed to the Studio dashboard and your previous session will be terminated. Note: You can resume a timed-out session on a different browser or even a different location. This section explains the ClinCapture Studio Guided Tour, which walks you step-by-step to build your first study. When you log in to ClinCapture Studio for the first time, a Welcome screen invites you to begin a guided tour, which guides you through building your first study and forms. On the top of the screen you will see a progress bar, which will walk you through all the steps needed to create your first study. As you complete the steps, they will be colored green as you proceed. There are five basic steps to building your first study. Click Let’s Start! to begin the guided tour. The Guided Tour is used to help you build your first study only. After that, you will use the Study Dashboard, which is covered further in this document. See Study Dashboard. The Guided Tour can be enabled or disabled in your profile, at the bottom of the page. The first step in the guided tour allows you to deploy a SAMPLE STUDY. A pre-built SAMPLE STUDY is provided free of charge to allow you to explore the advanced features available in Captivate. Select the region in which you want to host your study. Specify a unique URL for your study. The study URL is made up of two parts: Region name and Resource ID. The resource ID defaults to the first eight characters of the Sponsor Name (excluding spaces and special characters). If necessary a sequence number will be used to make it unique. The resource ID can be edited, if necessary. Provisioning the SAMPLE STUDY normally takes 2 or 3 minutes. When the SAMPLE STUDY has been deployed, the Deploy SAMPLE STUDY step in the guided tour is colored green, indicating that step is complete. You will receive an email a few minutes after your study is deployed, which contains a link to your study, as well the users credentials to demonstrate the various user roles. Unless you deploy your own study in the same URL, the SAMPLE STUDY will be automatically decommissioned seven days after deployment. To give you a head start on your study, the CRFs used to create the SAMPLE STUDY will appear in your CRFs LIBRARY. If you wish, you can remove those CRFs from the CRF library by decommissioning and deleting the SAMPLE STUDY. Complete the Study Properties. Watermarks are provided to help you determine the types of data you should enter. All fields are required and are marked with a red asterisk. Study Name* Type a name for your study, using up to 91 characters. Expected Study Start Date* Select the start date for your study from the drop-down calendar. Unique Protocol ID* Type a unique protocol ID for your study. Protocol Type* Select a protocol type from the drop-down list. Expected Enrollment* Type the expected enrollment number, using up to 10 characters. Note: This number is for informational purposes only, and can be exceeded as necessary. Principal Investigator* Type the name of the principal investigator for the study, using up to 100 characters. Brief Summary* Type a brief summary of the purpose of the study, using up to 2000 characters. Sponsor Name* Type the sponsor name. The sponsor name is auto-populated from your profile’s company name. It can be changed as needed. Study Type* Select the study type from the drop-down list. Select Study Plan* Select the study plan from the drop-down list. See Plans and Pricing. Therapeutic Area* Select the therapeutic area related to your study from the drop-down list. Features Add-On Select the feature(s) you want to add to your study: Medical Coding, Randomization, ePro or eSource. Note: Additional setup fees may apply. The Create Study step in the guided tour is colored green, indicating that step is complete. Complete the form properties. All fields are editable and required fields are marked with a red asterisk. Form Type * Select Normal or Randomization. The Randomization type form allows you define stratification variables and randomize subjects. All SAS compliant names must begin with an alpha character or an underscore. The form name and the Reporting Label can be up to 40 alphanumeric characters, including spaces and underscores. CRF Item Name, Table Name and Option Names and Values must be 8 alphanumeric characters, including underscores. Specifically, spaces are not allowed in these names. SAS reserved keywords are not allowed. Form Name * The form name. The form name can be changed at anytime. Version * Enter a major version identifier for the form. It can be a number or a text string, for example “test”. Form Studio will add .0 (a minor identifier) to your version identifier. It will increment the minor version indentifier, for example .1, .2, .3, etc., as you iterate publishing and editing the form. Older form versions can be deleted, as long as they are not linked to clinical data or rules. Brief Description * A description of the form, using up to 2000 characters. Comments * Any informational comments you wish to add. Complete the Field Options. These options control the behavior and display of the following parameters in the configuration panel. The items in your form can be configured with pre-set options such as auto-numbering. You can set a Yes or No default value to control the field behavior. The default behavior can be changed while designing the form in Form Studio if you check the box Allow override. For example, if most items in the form must be auto-numbered, while a few should be un-numbered, you should set Auto-number fields to Yes and check the box Allow override. Auto-number fields Select Yes if the form contains auto-numbered items, or select No if the form does not contain auto-numbered items. Note: Check the box Allow override to allow the default value to be changed in Form Studio. Data entry required Select Yes if data entry is required for all the items on this form, or select No if data entry is not required. Note: Check the box Allow override to allow the default value to be changed in Form Studio. Contains PHI data Select Yes if the form contains Protected Health Information (PHI) data, or select No if the CRF does not contain PHI data. Note: Check the box Allow override to allow the default value to be changed in Form Studio. Require Reporting Labels Select Yes if a reporting label is required for all items in your CRF, or select No if reporting label is not required. Show build notes Select Yes if build notes should be shown for the form in Form Studio, or select No if build notes should not be shown. Form Studio opens. See Designing a Form. When you are finished designing your form, click Save & Exit. The Create Form step in the guided tour is colored green, indicating that step is complete. The next step in the guided tour requires you to enter a credit card , or establish a contract, and deploy your study. Credit Card Number * Type your credit card number. CCV * Type the credit card verification number. Expiration Month * Select the expiration month for your credit card from the drop-down list. Expiration Year * Select the expiration year for your credit card from the drop-down list. Address Line 1 * Type your billing address. Address Line 2 * An optional second line is provided for your billing address. City * Type the city of your billing address. State / Province / Region * Type the state/province/region for your billing address. ZIP / Postal Code * Type the ZIP/postal code for your billing address. Country * Type the country for your billing address. Check the I understand and agree to terms of service box. Your credit card information is NOT stored on our system. Once a credit card is validated, we only keep an encrypted record number that is passed to the payment provider to invoice. If you wish to pay by Purchase Order or other methods of payment, you will need to contact ClinCapture to create a billable account and be authorized to deploy your study. When a user creates a study for a new sponsor, that user assumes billing responsibility for all studies deployed for that sponsor; ie he/she is the account owner. In Studio, this user is called the Sponsor Owner. There are 2 ways other users can deploy a study for a given sponsor, however the original Sponsor Owner will receive the invoice and is responsible for paying it. You will need to contact ClinCapture support to change the Sponsor Owner. To allow other users to create and deploy studies for that sponsor, the Sponsor Owner can share a study with “Owner” access. Other users who are shared “owners” can deploy additional studies for the same sponsor. The user can request authorization to deploy a study by clicking Authorize in the Study Action dropdown. Payment is initiated as soon as you deploy your study, pro-rated for the period remaining in the current month. Monthly automatic payments will continue until your study is archived or decommissioned. Select a payment option which is either a credit card already entered, or an established contract. If this is the first study deployed for the sponsor, you will need to specify a unique URL for this study. The study URL is made up of two parts: Region name and Resource ID. Click Deploy or Authorize if you are not authorized to deploy a study. The hosting agreement window opens. Read the hosting agreement and click Acknowledge. Click Print at the bottom of the agreement to produce a paper copy, if needed. The system will take about 3 to 5 minutes to provision your private Captivate instance. The Billing Options/Deploy Study step in the guided tour is colored green, indicating that step is complete. A congratulations message will display when your study has been deployed. Click Exit to conclude the guided tour. You will receive an email a few minutes after your study is deployed. 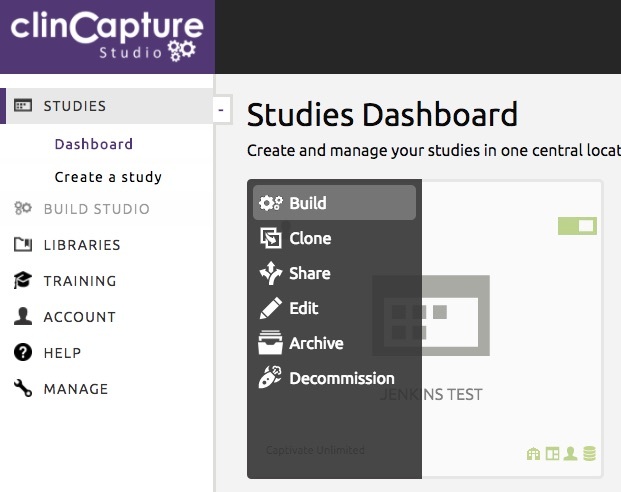 Log in to Captivate, using the same Studio credentials, to finish building your study. See the Captivate User’s Guide for detailed information. Two studies will be created. One of them will be labeled @Build –. This study allows you to build and test your study. Once satisfied with your build, you must recreate your events before going into production. 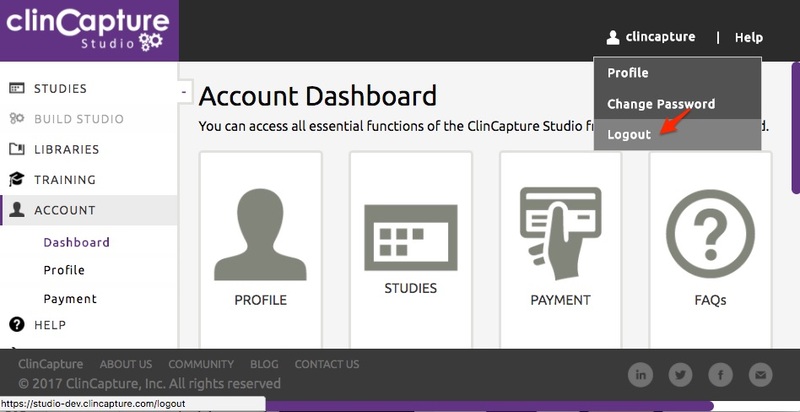 You can access all essential functions of the ClinCapture Studio from your account dashboard. Navigate to Account > Dashboard. You can update all aspects of your profile, except your Username. From the Account Dashboard, click PROFILE. Update your profile as necessary. All fields are editable and required fields are marked with a red asterisk. First Name * Your first name. Last Name * Your last name. Email * Your valid email address. Job Title * Your job title. Company * Your company name. If your email domain matches another user’s domain, you may select a company name from the drop-down. International Phone Number * Your business telephone number. The following character types are allowed: Numbers, Space, Parentheses ( ), and Dash -.Please provide a valid phone number in order to verify your account. We will send you a verification code, either via SMS or voice message in order to confirm you own the phone number. Address Line 1 * Your business address. City * The city in which your business is located. State / Province / Region * The state/province/region in which your business is located. ZIP / Postal Code * The ZIP or postal code for your business. Country * The country in which your business is located. Time Zone Select your local time zone from the dropdown list to display times in local time. Note: You can update all aspects of your profile, except your Username. From the Account Dashboard, click STUDIES, or select STUDIES > Dashboard from the left menu. The Studies Dashboard displays. The Studies Dashboard is covered further in this document. See Study Dashboard. You can edit your credit card information, or add a new one, and edit your billing information if you entered into a sales contract. From the Account Dashboard, click PAYMENT, or select ACCOUNT > Payment from the left menu. All credit cards you have added so far are listed in the grid at the top. Use the up/down arrows to sort the grid by any column. The payment information associated with each study is listed in a grid at the bottom of the screen. Use the up/down arrows to sort the grid by any column. Use the filter boxes to filter items displayed in the grid. Simply type a few characters into any filter box. The list will be filtered to include only those items that match the entered characters. To add a new credit card, click Add New Card. Expiration Year* Select the expiration year for your credit card from the drop-down list. Address Line 1 * Type your billing address, or click Use same address as profile. Address Line 2 An optional second line is provided for your billing address. Check the I understand and agree to the terms of service box. Click the drop-down menu corresponding to the credit card and click Edit. Update the expiration date and click Save. Click the drop-down menu corresponding to the credit card and click Delete. From the Account Dashboard, click PAYMENT, then in the pop-up window, select Credit Card. Click the drop-down menu corresponding to the credit card and click Set as Default. Future payments will be debited on the default credit card. From the Account Dashboard, click PAYMENT, then in the pop-up window, select Contract. You will see your contract details, including the number of studies you are allowed to deploy. If you reach the maximum number of studies deployed and need to deploy a new one, you will need to contact ClinCapture sales to upgrade your contract. Complete or edit the following. Required fields are marked with a red asterisk. Purchase Order Enter your purchase order. Bill to name * Enter your name, or the name of the person to receive the invoice. ZIP / Postal Code* Type the ZIP/postal code for your billing address. Review the Plans and Terms of Service. Certified training is provided free of charge, and certificates are provided to attendees upon successful quiz completion. Certified users are entitled to free support in North America. Click this icon to enroll for 8 instructor-led training modules. Most up to date information is also available here. From the Account Dashboard, click FAQs, or select HELP > FAQs from the left menu. View the FAQs to learn more about our plans, study build, compliance, security, etc. The questions are grouped by topic. To open a group, simply click the group heading. The most up-to-date list of FAQs is available here. From the Account Dashboard, click CONTACT US, or select HELP > Contact Us from the left menu. Fill out the provided form and one of our team members will be in touch with you shortly. You may also call (800) 987-6007. Inside the Studies Dashboard, click ADD NEW STUDY, or select STUDIES > Create a Study from the left menu. Complete the Study Properties. Watermarks are provided to help you determine the types of data you should enter. Required fields are marked with a red asterisk. Sponsor Name* Type the sponsor name. The sponsor name must be unique. However, if a study was shared with you as owner, you can create additional studies for the same sponsor. Note: If you are not authorized to deploy your study, its tile will be grey on the Studies Dashboard and Authorize will replace Deploy in the Action dropdown. From the Studies Dashboard, click the study you want to work with. The available options will vary, depending on the study status and your user role. From STUDIES > Dashboard, select the study you want to build. Click Build. Click several checkboxes to apply a mass action: Publish, Clone, Unpublish or Delete. From here you can click Create CRF to add another CRF to your study. See Designing and Managing CRFs for detailed information about how to build CRFs for your study. Alternatively, click Import CRF to upload a CRF compatible with Captivate (or OpenClinica) format in Excel. Various CRF templates can be downloaded to help you design your CRF in Excel: Normal, Randomization and Medical Coding. The Instruction tab provides help to create your CRF in Excel. From the study options, select Edit. The study properties display. You can edit them as necessary. Note: Once a study is deployed, the Protocol Type cannot be edited. From the study options, select Delete. Note that you cannot delete a study that has been deployed. Contact ClinCapture if you want to permanently delete one of your deployed studies. Click OK to confirm you want to permanently delete your study. A confirmation message displays when your study has been successfully deleted. From the study options, select Deploy. Check the box I understand and agree to the Terms of Service. Click Authorize in the study Action dropdown. The Sponsor Owner will receive an email requesting the study deployment and will be responsible for deploying your study. Once your study is deployed, you will be authorized to deploy additional studies for the same sponsor. Your username will be granted administrative access for both studies. Log in to Captivate to finish building your study. From the study options, select Clone. Complete the Study Properties. Properties from the existing study are provided but you can change them as necessary. Required fields are marked with a red asterisk. Study Start Date * Select the start date for your study from the drop-down calendar. Unique Protocol ID * Type a unique protocol ID for your study. Protocol Type * Select a protocol type from the drop-down list. Expected Enrollment * Type the expected enrollment number, using up to 10 characters. Note: This number is for informational purposes only, and can be exceeded as necessary. Brief Summary * Type a brief summary of the purpose of the study, using up to 2000 characters. Sponsor Name * Type the sponsor name. Study Type * Select the study type from the drop-down list. Select Study Plan * Select the study plan from the drop-down list. See Plans and Pricing. Therapeutic Area * Select the therapeutic area related to your study from the drop-down list. Choose Payment Option * Select the payment option from the drop-down list. From the study options, select Share, or click on the sharing icon. Enter the email address of the person you want to share your study with. Select the Access Level you want to grant. Owner An Owner has full access to the Study and the CRFs. This role allows you to delegate full ownership of your Study to another user. The delegated owner can manage, edit, delete and re-share your study. You will still retain your original rights.If your study is shared as owner, you can create additional studies for the same sponsor as the study being shared. Collaborator A Collaborator has read-write access to the CRFs. Assign this role if you need multiple users to work together creating and designing CRFs. Viewer A Viewer has read access to the CRFs. 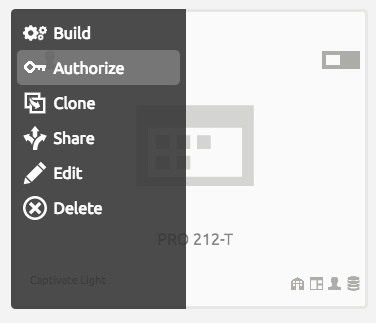 Assign this role to let a user to view your CRFs’ design. Reviewer A Reviewer has read access to the CRFs and can leave review comments in the Build Notes. The review comments are saved in an audit log and extracted with the CRF specifications. Assign this role to let a user to review your CRFs’ design. An email will be sent to inform the person you are sharing your study with them, which explains their access rights and provides a link to the study. This person does not have need to be a current user in the portal, however, they will need to register before they can access the shared study. When your study is shared, this icon is displayed. Sponsor: User who created the first study for a sponsor. This user is responsible for billing for any study deployed under that sponsor name. Creator: User who created the study. This user is the original study owner and can share this study with other users. 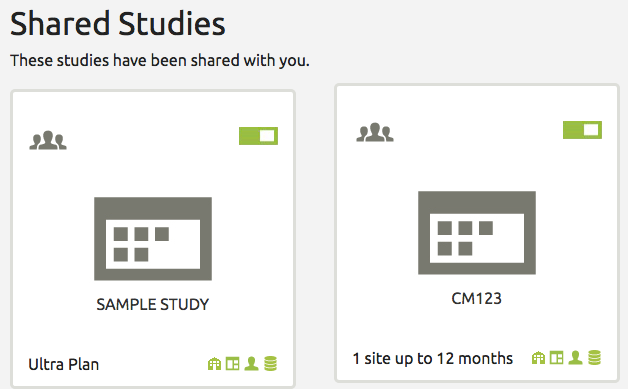 When a study is shared with you, it will appear under the Shared Studies section of the dashboard. Only deployed studies can be archived. Archiving a study does not destroy data or the forms associated with it., however, the forms are no longer accessible in the LIBRARY. Once a study is archived, it can be restored to its deployed state, until it is decommissioned. 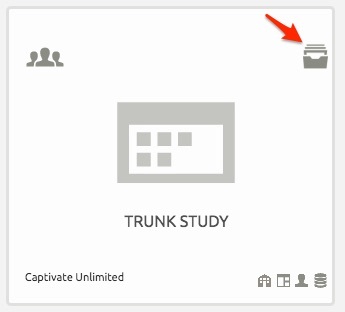 An archived study is greyed-out and is indicated by this this icon. When you archive a study, an email is sent to Sales who will contact you to discuss archiving options. All archiving options include receiving a compressed copy of your database . If necessary, your database copy should enable you to restore your study data. SAS datasets can also be provided upon request. Option 1 – Near-line forever: The study database will be kept near-line, allowing us to restore your study within 24-hours. This option includes a fee for archival and monthly storage. There is no limit to the retention period. There is no additional fee to restore the study. Option 2 – Archival: Your study database will be put offline and the system decommissioned. This option includes a fee for the archival process and an optional monthly fee for storage, should you require ClinCapture to store a copy of your database. Default retention period is 7 years, but additional retention time can be negotiated. Should you need to fully restore your study, a fee will be applied to restore your database. Option 3 – Backup for 8 weeks: If you do not require long term archival, your study data will be deleted and the system decommissioned. ClinCapture will keep a backup for 8 weeks, but not beyond. There is no archiving fee for this option. However, a fee will be applied to restore your study from our backup (within 8 weeks of the archive request) or from your electronic copy. From the study options, select Archive. Click OK to confirm you want to archive the study. From the study options, select Restore. Click OK to confirm you want to restore the study. Only deployed or archived studies can be decommissioned. During decommissioning, the URL and the Captivate the web application that allows you to collect clinical trial data are deleted along with all clinical data associated with all the studies deployed in the same URL. With the exception of the SAMPLE STUDY, and because this function can have harmful consequences if misused, only special users (ClinCapture IT staff) are allowed to decommission a study. If you did not deploy any other study in the same URL, you can decommission your SAMPLE STUDY. However, if other studies were deployed in the same URL where the SAMPLE STUDY resides, you can only archive it. From the study options, select Decommission. Click OK to confirm you want to decommission the study. Study usage can be monitored visually using the indicators at the bottom of the study icon. From left to right, these indicators represent: the number of sites, the number of CRF pages collected, the number of user roles assigned to the study and the total storage used. The Sites metric includes the number of sites in your study. The CRF Pages metric includes the number of CRF pages where data entry was initiated or completed, including following states: “Initial Data Entry Started”, “Double Data Entry Started”, “Data Entry Completed”, “SDV-ed”, “Signed”, “Locked” and “Removed” (but not deleted). A CRF page is defined as a CRF section or Tab. Thus, multiple CRF pages may be contained within a CRF form. The User Roles metric includes all user roles defined in Captivate that are assigned to the study. Please note that if a person has many roles in different studies, the different roles are counted in this metric. However, if a user account has access to multiple sites within a study, it will count as one role. The Storage metric includes CRF data, CRF attachments and data imported or exported (and not deleted from the application). Please note that the storage related to the study configuration is not included. Usage metrics are updated once a day. The indicator turns orange when usage grows over 80% and red when usage is over 90% of the threshold for the current study size. Studies created after 01-Sep-2017 – Only site metrics are applicable. 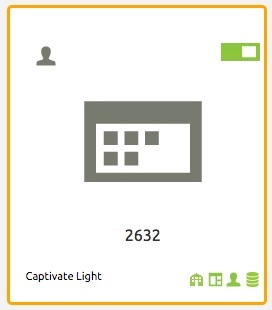 Captivate Light has up to 10 sites and Captivate Standard up to 25 sites. The Captivate Global plan has unlimited sites. Studies created after 01-Apr-2017 , before 01-Sep-2017 – Only site metrics are applicable to the ClinCapture plans (up to 10 sites and up to 20 sites). The Captivate plan has unlimited sites. Studies created after 01-Oct-2016, before 1-Apr-2017 – Usage metrics are the usage for your production studies only. Studies created before 01-Oct-2016 – Usage metrics aggregate the total usage for your development (@Build) and production studies. Size thresholds depend upon your study plan. See Plans and Pricing. You can click the bottom of the study icon to display your current study usage details. When one of the metrics exceeds the size threshold (for example 11 sites in the Captivate Light plan), you will receive an email about this event and will be contacted by a Sales representative to discuss your needs. On the study dashboard, a red indicator will be shown. The usage pop-up indicates which metric threshold has been exceed for the current size. Complete the form properties. Watermarks are provided to help you determine the types of data you should enter. Required fields are marked with a red asterisk. Form Type The form type is: Normal or Randomization. If you select Normal, the Randomization tool will not display in Form Studio. 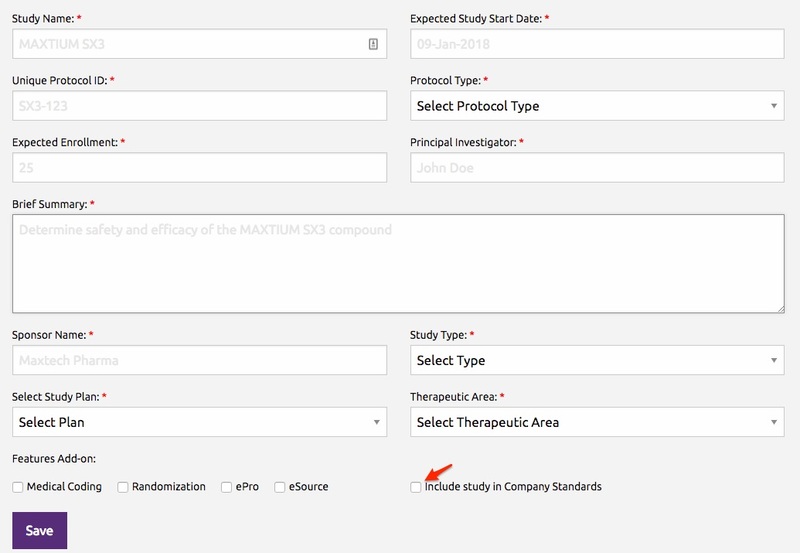 The Randomization form type is only available if it is selected as an add-on for the study. Form Name * The form name. Note: Because you can share forms among studies within a single sponsor, form Names must be unique within sponsor. Once a form is published, you cannot change the name. Version * Enter a version identifier for the form. It can be a number or a text string, for example “test”. Form Studio will add .0 to your version identifier. It will increment the minor version number, for example .1, .2, .3, etc., as you iterate publishing and editing the form. Once a form is published, you cannot change the version. Brief Description A description of the form, using up to 2000 characters. Comments Any informational comments you wish to add. Click Next to complete the Field Options. These options control the parameters that display on the configuration panel. 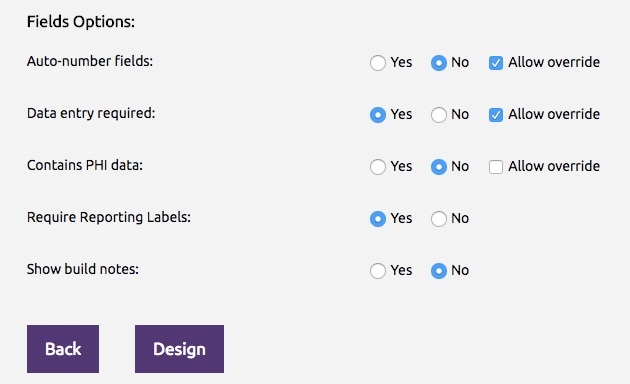 The items on your form can be configured with pre-set options such as auto-numbering. You can set a Yes or No default value to control the field behavior. The default behavior can be changed while designing the form in Form Studio if you check the box Allow override. Hover over the left option text to learn more about it. Set the option default value. These options will not be configurable in Form Studio unless you Allow override. Contains PHI data Select Yes if the form contains Protected Health Information (PHI) data, or select No if the form does not contain PHI data. Note: Check the box Allow override to allow the default value to be changed in Form Studio. Show build notes Select Yes if build notes should be shown for the form in Form Studio, or select No if build notes should not be shown. Note that if a study is shared with a Reviewer, the build notes will be enabled regardless of this setting. Locate the relevant CRF in the CRF table, if necessary using the filtering and sorting features. From the Action dropdown, click Publish. On the Publish Form page, you can set a different CRF version, this is recommended to indicate your changes are significant. Then click Submit. ClinCapture Studio will indicate whether or not the publish operation was successful. An email is sent, reporting that the CRF that failed to publish. The errors generated by Captivate are displayed on the portal. Note: You cannot change the CRF version using a mass publish action. In a mass publish action, the major version string is unchanged and the minor version will be incremented. From the Action dropdown, click Edit. Make any necessary changes to the CRF properties. Watermarks are provided to help you determine the types of data you should enter. Required fields are marked with a red asterisk. Form Type * The form type is: Normal or Randomization. If you select Normal, the Randomization tool will not display in Form Studio. The Randomization form type is only available if it is selected as an add-on for the study. If you enforce SAS naming restrictions on an existing CRF, Studio will validate all the names in the CRF against the SAS 9.2 naming conventions. Errors must be corrected before this option can be set. CRF Name * The CRF name. Note: Once published, a CRF name cannot be changed. 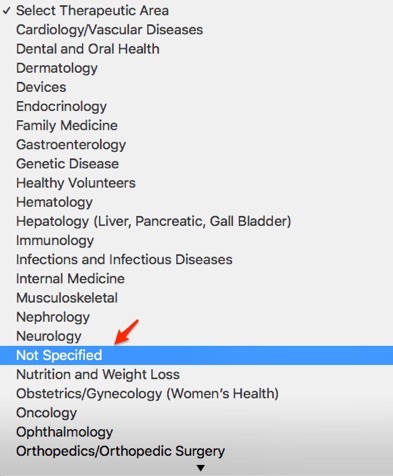 Because you can share CRFs among studies for a given sponsor, CRF Names must be unique within sponsor. Version * Enter a version identifier for the CRF. It can be a number or a text string, for example “test”. Form Studio will add .0 to your version identifier. It will increment the minor version number, for example .1, .2, .3, etc., as you iterate publishing and editing the CRF. Brief Description A description of the CRF, using up to 2000 characters. From the Action dropdown, click View. The CRF opens in view mode. You can see the CRF but you cannot make any changes to it. When you’re done viewing the CRF, click Back. When a CRF is published, it can be un-published to remove it from Captivate. From the Action dropdown, click Unpublish. Click Unpublish to confirm you want to remove the CRF from Captivate. If the CRF has associated clinical data, a similar pop-up window is displayed, giving you the option to Force Delete the clinical data, or keep it. This operation is not reversible. If you are unsure, click Keep Data. When the CRF has no associated data, its status reverts to Draft. From the Action dropdown, click Delete. Click OK to confirm you want to delete the CRF. The CRF is removed from the list. From the Action dropdown, click Clone. A sequential number is appended to the CRF name to make it unique. Optionally, edit the CRF name, version, brief description and comments. The cloned CRF appears in the CRFs list. A similar confirmation window is displayed. A sequential number is appended to the CRF names to make them unique. The cloned CRFs appear in the CRFs list. Click LIBRARIES from the left menu. Locate the relevant CRF(s) to be cloned in the CRF table, if necessary using the filtering and sorting features. Select the destination study. By default, your current study will be selected but you can select another one, as needed. If a single CRF is cloned, you can edit the CRF name, version, brief description and comments, as needed. Note: Multiple versions of a CRF can be cloned. From the Action dropdown, click Design. The CRF opens in Form Studio. Inside Form Studio, you can exit, save a CRF, or save a CRF and exit. Form Studio offers a simple yet powerful GUI to create all forms required in a clinical trial. It’s unique What-You-See-Is-What-You-Get (WYSIWYG) GUI allow you to visualize exactly how a form will look in EDC while designing it. There are many ways you can organize and design your CRFs layout simply by using drag and drop features. Refer to the images and guide below, using the numbers as a cross-reference. 3 Click icon Opens a new tab with the Captivate login page. Note that the study must be previously deployed. <…> icon Opens a new tab with the CRF specifications. The CRF specifications can be exported to Excel for review and submission. 6 CTL-C and CTL-V Copies and pastes a CRF item. This icon indicates the copy buffer is ready to be pasted. 7 Drag from Left Text Cursor is: Drags and drops the item icon into a table or grid. Drag from the shaded area’s right edge Cursor is: Resizes the width of the Left Text. Click anywhere Opens a panel to configure the area highlighted in yellow. 8 Drag from Right Text Cursor is: Reorders the item on the CRF. Drag from the shaded area’s right edge Cursor is: Resizes the width of the Right Text. 9 Indicates that a CRF item has skip logic or is referenced by skip logic. 10 Click and drag the column header on a table or grid Cursor is: Reorders table or grid columns. 11 Drag from the blue control bar Cursor is: Drags a question out of a grid or a table, onto the CRF surface. Click the + icon Adds a column to the right inside a table or grid. 12 Click the x icon Deletes a column from a table or grid. 13 Drag column dividers Cursor is: Resizes grid and table column widths. Note that the minimum width of a column is determined by the Right Text width. 14 Drag the right edge of a grid or a table Cursor is: Resizes the grid or the table’s width. 15 Red border Highlights inconsistent items. Inconsistent items must be fixed before the form can be saved. For example when you copy and paste an item, it will be inconsistent because it has a duplicate item name. You can also create inconsistent items using the library, for example copying am item with a duplicate option label, or referencing an option label that does not exist, etc. Position your mouse on the CRF tab. The entire CRF will be highlighted in yellow. Page name Enter a unique page name. The page name is displayed in the tab at the top of the CRF. The CRF page name can be clicked to access different page. If no page name is entered, Form Studio uses Page name by default and numbers pages sequentially. For example: Page name 1, Page name 2, etc. Title Type the text that should appear as the page title on top of the CRF in a grey bar. By default, Form Studio uses the CRF page name if no title is provided.You can bold, italicize, underline, add superscript or subscript, and/or change the text’s color. Line breaks are permitted. Subtitle You can enter a subtitle for the section. The subtitle is displayed under the CRF title in a grey bar.You can bold, italicize, underline, add superscript or subscript, and/or change the text’s color. Line breaks are permitted. Instructions You can enter any instructions to the data entry person to fill out this section of the CRF. Click the A to format the text. You can bold, italicize, underline, and/or change the text’s color. Click the + sign to add more CRF pages if desired. CRF items must be deleted first before you can delete a CRF page. A CRF page must contain at least one item before you can save it. Title, Subtitle and Instructions accept a subset of HTML elements, if additional visual effects are necessary. A CRF item is typically composed of a Left Text, input field and Right Text. However, some exceptions exist for certain items such as divider, grid, table, etc. To add an item to your CRF, simply click or drag and drop the item type you want to add to the CRF workspace. You can add any combination of the following item types. A text item. The user will type text data directly into a field. A number item. The user will type numerical data directly into a field. Integer and decimal numbers can be specified. A calculation item. Will display the result of a calculation, rather than requiring data entry. A list item. Users will select options from a drop-down list. A radio button item. Users will select an option by clicking a button. A checkbox item. Users will select options by clicking checkboxes. A file item. You can attach a file to the CRF. A table item. Users will fill out data in table format. Rows can optionally be labeled. A grid item. You can organize questions in a grid format, which allows more than one question to display in the same row. A medical coding item. Note: This option is available if you selected Medical Coding as an add-on for the study. A randomization item. Note: This option is available if you selected Randomization as an add-on for the study. A visual divider. You can add a divider to visually separate sections of questions on the CRF. A divider must always be followed by one or more questions. Dividers cannot be followed by a table, or any items containing a Header. After you add an item onto the CRF workspace, the next step is to define its properties. To do so, hover your mouse over the item. When it is highlighted, click your mouse to open the configuration panel. The actual pop-up you see depends upon the item type you added and the browser you are using. Refer to the images and guide below, using the numbers as a cross-reference. 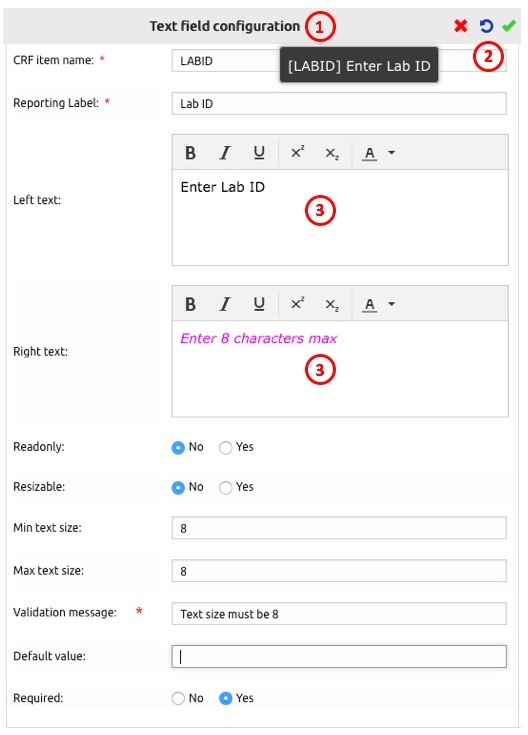 1 Configuration panel for the Text item. Hover your mouse to reveal the item name. 2 Click the red x to delete the item from the CRF. Click the counter clock-wise blue arrow to revert the item back to its previously saved state. Click the green check mark to save the item configuration and close the configuration panel. Note that you can click outside the configuration panel to perform the same action. 3 A Rich Text Editor is provided for special font effects. Complete the question configuration. Detailed information about the properties for each item type is provided below. You can relocate any item on the CRF by clicking the Right Text and dragging it up or down the CRF workspace, to its new position. You can also relocate a column in Table and Grid items by clicking on the header and dragging it to its new location. Make sure the area is highlighted in yellow before releasing the mouse, as it may take a few seconds on large tables. You can copy a CRF item by hovering your mouse over the item to highlight it, then using standard CTRL-C/CTRL-V keyboard shortcuts to copy and paste it. Pasting the CRF item places it at the bottom of the CRF. You can then relocate the item as necessary. After you have added all necessary items to the CRF, click Save & Exit. You are returned to the Study Dashboard where you can publish your CRF and create another one. Dividers allow you to create sections within the CRF page by assigner a header for a group of items. Dividers are not allowed to be followed by a table or any item containing a Header. The following properties can be configured for Divider. Click any property below to see its description. Grids provide a way for you to organize the questions on your CRF into multiple columns, which allows more than one question to display on the same line. Click or drag and drop the Grid item type to add it to the CRF workspace. A default grid is added at the bottom of the CRF workspace, which is comprised of one row and two columns. Click just outside the grid outline to specify the number of rows and columns you want to add to your grid. Note that a grid cannot contain less than two columns. Extraneous empty rows and columns will be removed when you save the CRF. Drag and drop a CRF item into one of the spaces on the grid. Note that grid, table, randomization and dividers items cannot be added to a grid. You can resize the column widths by dragging the column dividers inside the column headers to the left or right. See Form Studio for details. Complete the properties configuration for the item type you added. Continue to drag and drop CRF items and configure them until your grid is complete. You can relocate columns inside the grid by clicking and dragging the column blue control bar to its new location while keeping the mouse pressed down. See Form Studio for details. If needed, click the + icon to add another column to your grid. Or, click the x icon to delete a column from your grid. Before you can assign medical codes to your verbatim items, you must contact ClinCapture to configure your access to the medical coding appliance. ClinCapture will also verify that you have a valid license for the ontology you need to access. Note: The Medical Coding item is available only if you selected Medical Coding as an add-on for the study. Randomization method: Simple or Block. The Randomize Subject button and two fields are added automatically: Randomization result and Randomization Date. You cannot change or remove them. In addition, if the Kit ID option was selected, this field will also be added to the CRF workspace. The Randomization item is available only when Randomization is selected as an add-on for the study. Click or drag and drop the Table item type to add it to the CRF workspace. The first table column is automatically added for you. Drag and drop any of the items in the column. Make sure the drop location is highlighted in yellow before releasing the mouse. A new column will be inserted. Note that the following items cannot be dropped into a column: grid, table, dividers and randomization. Click the column header to configure the dropped item. Click and drag the column header to move a column to a different location on the table. Make sure the drop location is highlighted in yellow before releasing the mouse. You can resize the column widths by dragging the column dividers inside the column headers to the left or right. Click the + sign to add additional columns, if needed, and add items as previously described. Refer to CRF Items for a list of configurable properties supported by each item. Select Yes to automatically number items as they are added to or re-positioned in the form. Parent questions are numbered with a sequential integer such as: 1. 2. 3. etc. Child questions and table columns are sequentially numbered with a letter, for example 1.a 1.b 1.c etc. Select No to disable automatic question numbering. If necessary, you can type your own numbering scheme in the item’s Left Text. Allows users such as data managers to associate build notes to any CRF item. Such note may, for example, include an edit check specification for a field or provide a comment to the study builder. Build notes are also used to store comments from users with Reviewer role. The comments are authenticated and timestamped. They cannot be deleted. In addition, the build notes are included in the CRF specifications. Here is sample interaction between a CRF designer and a reviewer. Enter the calculation that should be run. The calculation will be an expression that takes the inputs of items of type Number. Note that once a CRF is published, the calculation cannot be changed. If a different calculation is needed, you will need to change the name of the CRF item. pow() uses two arguments: a number and the power. For example pow( 2, 3 ) is 8. We can use 0.5 for the square-root, thus pow(25, 0.5) is 5. We can calculate the absolute difference between Item1 and Item2, using: func: pow( pow( Item1 – Item2 , 2 ), 1/2). This functions first takes the power of 2 of the difference between Item1 and Item2 and then takes the square-root, resulting in the absolute difference. decode() uses 3 arguments: a variable to evaluate, one or more key-value pairs, a default. Temp, a Number field to enter the temperature. Unit, a List or Radio Button field with 2 temperature unit options: F to indicate Fahrenheit and C for Celsius. Result, a Calculation field to store the temperature in Celsius, regardless of the temperature unit selected. In our example, arg is Unit. If the Unit argument equals C, then we will store the value of item Temp as-is in the Result field. We will use the Fahrenheit conversion as the default, thus we will subtract 32 and then multiply it by 5/9. Therefore, our decode function is: func: decode( Unit, C, Temp,((Temp-32)*5/9)). Note that the calculation is performed when the CRF is saved. However, instant calculations can be performed with the onchange() function with arguments of an item name (the trigger item) and value. Number of columns configured in the grid when it is initially displayed. Columns number can be added by clicking on the ‘+’ icon or deleted by clicking on the trash icon in the column header. Unused right-most columns are truncated when the CRF is saved. Unused columns are not allowed in the middle of the grid. Uniquely identifies the variable name for the CRF item. CRF Item Name is used to manipulate the data item programmatically. To ensure compatibility with SAS, the item name length is 8 and must start with an alpha character. When the SAS naming restriction is not enforced, the item name length is 40. It must be composed of alphanumeric characters and underscores and may not contain any spaces. If a previously-published CRF item is renamed, the effect to rename a CRF item is that the old item is deleted and a new item is created. If data was entered on the original version, and then on the new version, the same information is collected in two fields. When the data is extracted, the data collected in the two fields will need to be manually merged in SAS. Also when re-assigning a CRF old version to a new version, the data collected under the previous item name will be lost, as the item name no longer exists in the new version. If a default value should display for this question on the CRF, select it from the drop-down list. The default value will be saved to the database if the user does not enter anything prior to saving the CRF. If a default value should display for this question on the CRF, enter it here. The default value will be saved to the database if the user does not enter anything prior to saving the CRF. Performs a calculation using variables entered in a table format. Select Yes to perform a tabular calculation. Select No to perform a non-tabular calculation. Description or definition of the CRF item that is used for reporting in SAS or other BI tools. This information is not shown on the CRF. If SAS naming restrictions are enforced, the Reporting Labels can be up to 40 alphanumeric characters, including spaces. Reporting Labels must be unique within a CRF. Select a medical coding dictionary from the drop-down list. Once a CRF is published, the Dictionary cannot be changed. Allows to control the size of the input field. This configuration option is only displayed if a validation is specified for a CRF item. Use Rules Studio for more complex rules or cross-forms edit checks. This field is not used for a Date, File, or Medical Coding type items. For the Time item type, the proper field validation is already provided to ensure a properly 24-hour formatted time is entered. You cannot change this expression. Can be used as a replacement for left and right item text or as a replacement for instructions. You can use a subset of HTML elements in this field. You can bold, italicize, underline, add superscript or subscript, and/or change the text’s color using the Rich Text Editor. Line breaks are permitted. Note: When headers are used in items inside a Grid, only the left most item header is displayed on the CRF. You can enter any instructions for the data entry person to fill out this section of the CRF. You can bold, italicize, underline, and/or change the text’s color. Select Yes if table rows should be labeled. You can edit the row labels on the table by clicking on them.Click Label 1 to specify a descriptive name for the first row, as well as the column header. Then continue to click each Row Label to specify a descriptive name for the each of the rows. Select whether to display the options horizontally or vertically. Type the text that should appear to the left of the item on the CRF, using up to 4000 characters. You can use a subset of HTML elements in this field. You can bold, italicize, underline, add superscript or subscript, and/or change the text’s color using the Rich Text Editor. Line breaks are permitted. Note: Left Text is not available if the CRF item is placed inside a table. This property restricts users from adding rows beyond the specified number. However, this restriction works only if data are entered interactively through Captivate’s GUI. If data are imported from a file or sent through web services, all data will be allowed to import, even if the rows of data exceed the specified number. Min rows specify how many blank rows should exist for the table upon initiation of data entry, or when printing a blank CRF from Captivate. A user can add more rows to the table, up to the Max rows and remove some of unused rows. In a labeled table, you can reduce the number of rows by changing this value. The reduction will cause rows to be deleted from the bottom of the table. Specify the minimum and maximum number of characters the question answer is allowed to be. Max text size must be blank, equal to or greater than Min text size. Select Yes to allow users to select multiple options from the list by pressing the Control or Shift keys. Type the text that should appear inside the section divider. You can bold, italicize, underline, add superscript or subscript, and/or change the text’s color. Line breaks are permitted. Specify whether the number should be an Integer or a Decimal. Real and float data types are considered decimals. Note that once a CRF is published, you cannot change the type of number you originally specified. Specify an option label to quickly reuse the options set you define in another List item. The label must be unique, composed of alphanumeric characters and may not contain spaces. If you have previously defined an option label, you can select one from the drop-down list to reuse it in this question. The saved option names and values will automatically populate. Note that a single select list cannot reference an option label from a multi-select list. Enter the names and values for the options to display in the list. Any character, including a comma can be used as an option name or value. One or more blanks are allowed for Option Name. Note that once a CRF is published, you can add new option names and values but you cannot change or delete published names and values. Enter a unique page name. The page name is displayed in the tab at the top of the CRF. The CRF page name can be clicked to access different page. If no page name is entered, Form Studio uses Page name by default and numbers pages sequentially. For example: Page name 1, Page name 2, etc. Select Yes to allow users to enter a partial date if the full date is unknown. Note that once a CRF is published, you cannot change the type of date you originally specified. Automatically assigns the randomized subject to a treatment group. Dynamic Groups those names correspond to the randomization result must defined; for example “Radio Therapy”. See Adding Groups for details. Automatically changes the Subject ID to the randomization result. The randomization result is simply stored in the CRF. Returns a randomization ID and a kit ID. Select Yes if the CRF item should be read-only in Captivate. Select Yes if the user is required to answer this question. Select Yes to allow the user to adjust the size of the text box. This is very useful if a large amount of text must be entered. Type the text that should appear to the right of the input field on the CRF, using up to 2000 characters. Used to ask a question, specify a unit, or provide supporting instructions or other comments. You can use a subset of HTML elements in this field. You can bold, italicize, underline, add superscript or subscript, and/or change the text’s color using the Rich Text Editor. Line breaks are permitted. Note: Right Text is stripped if the CRF item is placed inside a table. Number of rows configured in the grid when it is initially displayed. Rows can be added or deleted. Deleted rows are removed from the bottom. Unused bottom rows are truncated when the CRF is saved. Unused rows are not allowed in the middle of the grid. You can use skip logic to dynamically show hidden items on a CRF. Select Show to show a question when the CRF is opened. The CRF item name is the name of a CRF item containing options. Only list, radio buttons and checkbox item names will be available in the dropdown menu. The Option name is the name of the option in the item specified above to trigger the display state change. It must be selected from the dropdown menu. If you enter data in a question that contains skip logic, the skip logic will be executed. If the data condition is met, the display status of the skip item will be changed. If the data condition is not met, the skip item is put in its initial display state. Questions that use skip logic are marked with an information icon. Hover your mouse over the icon to see this message. Set to Yes if this specific item must be source data verified. Otherwise, set to No. You must specify an error message to be displayed to the data entry person if the stratification variable is incorrect or missing. If you selected Randomization as an add-on for your study, you can designate this CRF item as a stratification variable. Note that the randomization scheme, including stratification variables, must be configured by ClinCapture before you can randomize subjects. See Randomization Item for details. Note: Items marked as a strata variable cannot be modified or deleted once they are published. Select Yes to mark this CRF item as a stratification variable. Form Studio will also assign a special CRF item name to this field that cannot be edited. Select No and this CRF item is not used as a stratification variable. Once a CRF is published, items configured as a stratification variable cannot be relocated or reconfigured. If you are using a Header for this item, you can specify a subheader. The subheader text displays underneath the Header, is separated by a line and has a grey background. You can use a subset of HTML elements in this field. You can bold, italicize, underline, add superscript or subscript, and/or change the text’s color using the Rich Text Editor. Line breaks are permitted. The subheader must be 240 characters or less. You can enter a subtitle for a CRF section. The subtitle is displayed under the CRF title in a grey bar. You can use a subset of HTML elements in this field. You can bold, italicize, underline, add superscript or subscript, and/or change the text’s color using the Rich Text Editor. Line breaks are permitted. Uniquely identifies the variable name for the Table item. Table name is used to manipulate the data item programmatically. To ensure compatibility with SAS 9.2 naming, the Table item name length can be up to 8 characters and it must start with an alpha character or an underscore. Spaces and SAS reserved keywords are not allowed. When the SAS naming restriction is not enforced, the item name length is 40. The name must be composed of alphanumeric characters and underscores and may not contain any spaces. Note: Previously-published Table item cannot be renamed. Type the text that should appear as the page title on top of the CRF in a grey bar. By default, Form Studio uses Page Name if no title is provided. You can bold, italicize, underline, add superscript or subscript, and/or change the text’s color. Line breaks are permitted. Specify a validation expression to run an edit check on this CRF item. Select the validation type for a number field. Specify the minimum and maximum values for the number. If the number is a decimal, the values specified in these properties must also be a decimal and meet the decimal size requirement. Specify the valid enumerated values. The format should be a number followed by a vertical bar and a number (NUMBER|NUMBER). For example, if valid responses are 0, 1, and 9, you should enter 0|1|9. Click the Metadata link at the top of the CRF. A page opens in a new tab that displays the metadata for the CRF. 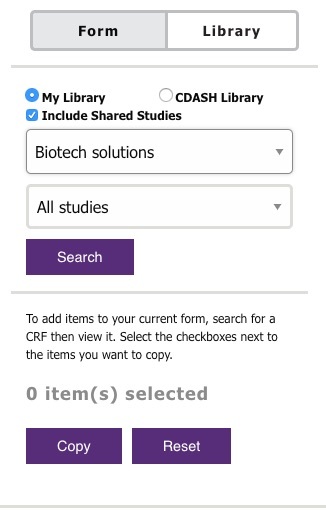 To add one or more items to your CRF from either the User Library or the CDASH Library, first select the Library tab in Form Studio. Select My Library to use your user library, or select CDASH Library. The User Library lists all the CRFs used by the user (created or cloned). To additionally display CRFs from shared studies, check the Include Shared Studies box. Use the search drop-down lists to find CRFs from your library for a specific Sponsor or Study Name. Once you have made your selections, click Search. A similar table will be displayed. You can use the provided filters to filter the CRFs by CRF Name, Version, Status, Created date, Updated date, Author, Study or Sponsor. Simply start typing in one of the filter boxes. The list will filter to include those matching the entered characters. To re-display the whole list, remove the characters in the filter boxes. Click the up/down arrows to sort the list in ascending or descending order. You can view any of the CRFs in the list. The CRF opens in read-only format. Select the items you want to copy by clicking on the checkboxes next to them. Click the Copy button. You will be notified when the items have been successfully copied. If needed, continue copying items, possibly from another CRF. When you’re done, click the Form tab to return to your current CRF. The copied items should be added to your CRF; see considerations for copying items with skip logic and response labels below. You can use the library to copy an entire page or section of a CRF. To copy a page, click the checkbox in the CRF tab. This will automatically select all the items. When you click the Form tab to return to your CRF, you have the option to copy the items to a new page in the CRF or the existing page. To copy a section, click the checkbox in the CRF divider. All questions up to the next divider or end of the CRF will be selected. You can reset, or un-copy, the CRF items prior to returning to the Form tab by clicking Reset. Items are not renamed during the copy operation. You can copy the same items multiple times but you must assign them unique item names before saving your CRF. The following must be considered when using the library to copy questions involved in skip logic. In the points below, the skip logic reference (the CRF item name used in the skip logic) is called the parent item. The items containing the Hide skip logic are called the children items. If a child item is selected, the parent item involved in the skip logic will be automatically selected. If the parent item is inside a grid, the entire grid will be selected. If after copying any items need to be fixed (for example, if there are duplicate item names or labels or a parent in skip logic is missing), they will be highlighted with a red border and must be fixed prior to saving the CRF. My Forms, a user library containing CRFs created or cloned by a user, or CRFs from studies shared with a user. Company Standards, a corporate library of Studies and CRFs managed by the Standards Manager user. See Company Standards for details. Industry Standards, a global library of CRFs managed by ClinCapture. It include CRFs that conform to the CDASH standard and others. From the left menu, click LIBRARIES. Select My Forms in the submenu. The CRFs contained in the library are listed. To display additional CRFs from shared studies, check the Include CRFs from shared studies box. Use the search drop-down lists to find CRFs from your library for a specific Sponsor, Study Name, and/or CRF Name. Once you have made your selections, click Search. Click More to display the Therapeutic Area and Comments associated with a specific CRF version. You can also use the provided filters to filter the CRFs by CRF Name, Sponsor, Therapeutic Area, Version, Comments Status, Created date, Updated date, or Author. Simply start typing in one of the filter boxes. The list will filter to include those matching the entered characters. To re-display the whole list, remove the characters in the filter boxes. Click the up/down arrows to sort the list in ascending or descending order. Click the CRF menu action and select View or Clone. View opens the CRF is read-only mode. To clone a CRF, see Cloning a CRF for details. Mass action is possible by checking boxes, next to the action menu, to select multiple CRFs. Standards Managers can access all the forms developed in their organization when they check the Include CRFs from shared studies box. Studio offers a very flexible mechanism to setup, manage and access a company-wide library containing standard studies and CRFs for certain therapeutic areas or study types. You can create a study and include it in the company standards library. When a study is included in the company standards library, all of its CRFs will automatically be included in the My Forms library. You can view all the studies created within your organization, including those for different sponsors, if applicable. You can clone any CRF created in your organization from My Forms library into a standard study. if a CRF becomes obsolete it can be hidden from the company standards library, or versioned if the standards change. Next, the CRFs to be included in the standard study must be created or cloned from other studies. Many studies can be designated as Company Standards. For example, a Sponsor may have different standard studies for different therapeutic areas. A Clinical Research Organization may have different standards for different Sponsors, etc. Standards Managers can clone studies shared with them as Owner or Collaborator. The Standards Manager has read access to all CRFs created within his/her organization. In addition they can review these CRFs and create build notes for the study builder, for example to inquire about non-standard CRFs items. Standards Managers can add, delete, hide or assign a new version to CRFs belonging to Company Standards studies. New CRFs can be created from scratch. CRFs can be cloned from any other study created for a given organization, using My Forms library. They can then be optionally modified to adhere to a specific standard. CRFs must unpublished, if previously published. Click Delete from the CRF menu option. The CRF is deleted from the CRF list in Form Studio. Select Design from the CRF menu option. In Form Studio, check the box Hide form from Company Standards library. The CRF is displayed in light grey font in the CRF list to indicate that it will be hidden from users accessing the Company Standards library. Make the necessary changes to the CRF in Form Studio. Assign a new version and/or comments in the popup window, then click Update. Comments are version specific and are visible to users accessing the Company Standards library. Any user within an organization has access to the Company Standards library. See Form Libraries for details. Select Industry Standards in the submenu. You can also use the provided filters to filter the CRFs by CRF Name, Therapeutic Area, Version, Comments Status, Created date, Updated date, or Author. Simply start typing in one of the filter boxes. The list will filter to include those matching the entered characters. To re-display the whole list, remove the characters in the filter boxes. Click the up/down arrows to sort the list in ascending or descending order. 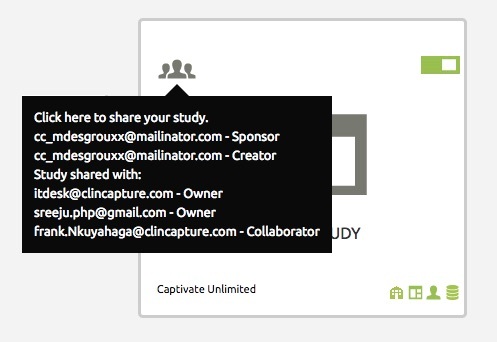 After you have deployed your study in ClinCapture Studio, you need to finish building your study in Captivate. Log in to Captivate. Your URL and login credentials were emailed to you when you deployed your study. The build page for the @Build – study will be displayed. Alternatively, you can also access this page by navigating to Tasks > Build Study. A list of tasks displays. You will be starting out on step 3 – Create Event Definitions. Assuming you have already published some CRFs, there are five steps to complete your study in Captivate. The first step in completing your study build is to define events. Scheduled – A scheduled event is one that is expected to occur for each subject as part of the ordinary progress of the study. Unscheduled – An unscheduled event is not expected to occur, but may occur as circumstance dictates. Common – A common event collects data forms, but is not expected to be associated with a particular time. Calendared – A calendared event is an automatically scheduled visit. Calendared events can be automatically scheduled at the completion of a reference event according to your study protocol. Navigate to Tasks > Build Study. Click the plus (+) sign next to step 3 – Create Event Definitions. Complete the following. Required fields are marked with an asterisk. Name * The name of the event. Description The description of the event. Type * Select the event type from the dropdown list: eSource*, Scheduled, Unscheduled, Common, Calendared. * Requires the eSource feature to be enabled. Repeating If you selected Scheduled, Unscheduled or Common as the event type, select Yes if the event is repeating.Repeating indicates this event can occur multiple times for a subject within the study. Day Schedule – The number of days this event will be automatically scheduled after the last reference event completes. Day Max – The maximum days that this event can be completed after the last reference event is completed. Completing this event later generates an automatic query. Day Min – The minimum days that this event can be completed after the last reference event completes. Completing this event early generates an automatic query. Day Email – The number of days a reminder email is sent out after the last reference visit is completed. User Name – Type a valid user name to be reminded by email for the visit. Category Specify a category for the event. The category is generally used to indicate the study phase. For example, Screening, PreTreatment, Treatment, FollowUp. Select the CRFs to include in the event by clicking the corresponding checkboxes. For each of the selected CRFs, complete the following. Required Check the box if the CRF must be completed for the event. Double data entry –Two users must enter the same data for the CRF. CRF data evaluation – The data must be evaluated by a Study Evaluator. If data is changed, a Reason For Change must be created. Password Required Check the box if the user must enter their password to save the data for the CRF. Default Version If there are more than one version of the CRF, select the version from the dropdown that should default for the event. Accept New CRF Versions For Sites When this checkbox is checked and a new CRF version is available, sites can be automatically be updated. This function can be disabled on a per-site basis. Hide CRF Check the box if the CRF should only be viewable at the study level. If this option is selected, sites cannot access the CRF. Entire CRF – All CRF items must be monitored. Specific items – Specific CRF items must be monitored. These items must be marked for source data verification in Form Studio. These setting can be overridden in Captivate. Not Required – The CRF is not included in the list of CRF to be source data verified. Complete to send an email when the CRF is completed. Left to Right – This is the default. Review the Event to be defined. If you’re satisfied, click Submit. Click Subject Matrix in the Navigation Bar to verify the event was added to the subject matrix. You can change the order the events will appear on the Subject Matrix by clicking the up/down triangles. Before you can delete an event, you must first delete all CRFs attached to it. If data has been entered on any of the CRFs for a subject, that data must be deleted first. Click the View icon next to step 3 – Create Event Definitions. Click the Edit icon next to the event. Click the Remove icon for each CRF attached to the event. Click the Remove icon next to the event. The second step in completing your study build is to design rules for cross-item and cross-form edit checks. When a Study is created, edit checks are required to ensure the validity of the data. In previous versions of Captivate, soft edit checks were programmed in XML. Rules Studio simplifies the creation and modification of edit checks while avoiding the need for XML programming skills. This feature allows System and Study Administrators to implement, modify and copy rules using an intuitive drag-and-drop graphical user interface. Navigate to Tasks > Rules. Click the Design a Rule button. Top Panel – The Top Panel displays the ClinCapture Rules Studio logo. Data Panel – The Data Panel features the different types of data that can be dragged and dropped into the Expression Builder. The types of data include: Text, Number, Date, Current date, Empty. You can also drag-and-drop CRF items for a selected study. As you navigate through the information path of a study: Study, Event, CRF, CRF version and CRF item, you will notice a “bread crumb” at the bottom of the Data Panel showing your current path. Click on any part of this bread crumb to navigate back one or more levels inside your path. Operators Panel – The Operators Panel consists of four tool boxes: Group, Compare, Calculate, and Condition. Each tool box contains icons that can be dragged to build the rule’s expression. Expression Builder – The Expression Builder area allows you to design or modify your rules. A rule is composed of data items, selected from the Data Panel, and various operators chosen from the Operators Panel. As you drop an item into the Expression Builder, Rules Studio tries to anticipate your next action and displays the next type of item in a box with dotted lines. Parameters Panel – This panel allows you to specify the rules parameters. In particular, the rule description, the rule target, which is the CRF item to attach the rule to, and the type of action implemented in response to a rule evaluating to either true or false. After designing a rule, you can verify that the rule is correctly specified by clicking the Validate Rule button. You can confirm the accuracy of the data captured in the CRF of a study by designing and implementing rules, sometimes referred to as soft edit checks. Navigate to the data item you want to insert into the expression. Drag-and-drop it into the Expression Builder. Notice that Rules Builder is predicting you need a Compare or Calculate item next. Drag-and-drop the Compare or Calculate item into the Expression Builder. Continue to drag-and-drop until your expression is complete. Rule name Specify a name for the rule. Target this rule to Specify the CRF item(s) to apply the rule to. You can drag-and-drop CRF items to this field. Multiple targets can be selected. To replace a target, drop another target on it. If the rule evaluates to Specify the true/false parameter for the rule. If you selected Create discrepancy, type the Discrepancy text that should display. If you selected Send email, specify an Email to address and Email message. If you selected Insert data, specify drag-and-drop a CRF Item and specify a Value. If you selected Show CRF Item, type a Message and drag-and-drop a Destination. If you selected Hide CRF Item, drag-and-drop a Destination. Set your scope to the @Build study. Click Edit for the desired rule to load it into Rules Studio. Click the Studies link to display your Studies list in the panel below. Click the name of your production study to select it. Click Keep in the popup window to preserve the rule. Click Validate Rule then Save to copy the rule to the other study. Click Exit to return to the Manage Rules page. Set your scope to your production study. Search for your rule’s name in the Manage Rules page. Click the Import Rules button. A rule can be manually tested to ensure its proper functioning. Specify the Target, the Rule Expression to test, and the parameters of the test for Actions if the expression evaluates to either true or false. Enter the test values for the different variables for the rule. The Verify Results panel summarizes the results of the test, and identifies whether or not the rule is valid. If it is invalid, a diagnostic message I the Alerts & Messages panel will display. If the rule is valid, it executes with the test parameters you supplied and the execution results are shown. Whether or not the specified action is triggered is indicated, along with the execution time. 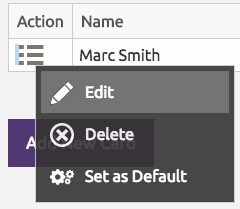 Click the Edit button corresponding to a rule in the Actions column. Note that you can edit any rule in Rules Studio, even one imported from XML. Refer to the Designing Rules section. Click the View button corresponding to a rule in the Actions column. Click Back to return to the Manage Rules page. Click the Run button corresponding to a rule in the Actions column. The rule is run against subject meeting the rule criteria. 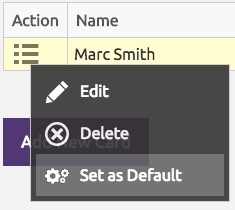 Click the Remove button corresponding to a rule in the Actions column. 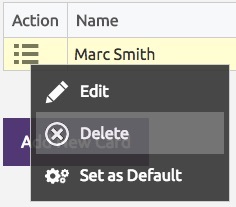 Click the Delete button corresponding to a rule in the Actions column. Click the Download button corresponding to a rule in the Actions column. The XML is downloaded immediately. Click the Test button corresponding to a rule in the Actions column. To display all rules applicable to the Item Name, click the View all rules for this item link. You can test the rule without any changes, or if desired, edit the existing target, the rule expression to test, and the parameters of the test for actions if the expression evaluates to either true or false. The Verify Results panel summarizes the results of the test, and identifies whether or not the rule is valid. If it is invalid, a diagnostic message in the Alerts & Messages panel will display. If the rule is valid, it executes with the test parameters you supplied and the execution results are shown. Whether or not the specified action is triggered is indicated, along with the execution time. The third step in completing your study build is to add subject group classes. Click the plus sign (+) next to step 4 – Create Subject Group Classes. Alternatively, you can also access the group management page by navigating to Tasks > Groups. Name * The name of the subject group class. Dynamic Group – Allows you to assign a different set of visits to a subject, for example if a protocol compares the effects of multiple treatment types, such as: surgery, chemotherapy and radio therapy within the same study. In such studies, subjects are typically randomized into one of these Dynamic Groups to undergo the visits associated with their treatment type. Subject Assignment * Specify whether the subject assignment is Required or Optional. Study GroupsName/Description Enter the names and descriptions of the desired study groups. Default Check the box if this dynamic group should be the default. The default dynamic group can be used to automatically assign to the subject when it is created. You cannot assign the same visit to multiple dynamic groups. You can re-order the visits within a treatment group by clicking the up/down triangles. Review the Subject Group Class to be defined. Events associated with Dynamic Groups are shown on the left side of the Subject Matrix, starting with the group marked as the Default. You can reorder the group by clicking the up/down triangles in the Manage All Groups page. The fourth step in completing your study build is to add sites. Click the plus sign (+) next to step 6 – Create Sites. Alternatively, you can also access the site management by navigating to Tasks > Sites. Complete the Site Properties. Required fields are marked with an asterisk. Parent Study The name of the study currently being built. This is a read-only field. Site Name * Enter the site name. The site name must be unique. Unique Protocol ID * Enter the protocol ID. The protocol ID must be unique. Secondary IDs (separated by commas) Secondary IDs for the site. Separate entries by commas. Principal Investigator * Enter the name of the principal investigator, using up to 100 characters. Brief Summary A brief summary of the site, using up to 2000 characters. Protocol Verification/IRB Approval Date Enter the date of protocol verification/Institutional Review Board approval. Click the calendar icon to select a date. Start Date The start date for the site in this study. Click the calendar icon to select a date. Estimated Completion Date The estimated completion date for the site in this study. Click the calendar icon to select a date. Expected total enrollment * The total number of subjects expected to be enrolled at the site for this study. This value is for reporting purposes only; you can enroll a greater number or fewer number of subjects. Facility Name The facility name. Facility City The facility city. Facility State/Province The facility state/province. Facility ZIP The facility ZIP code. Facility Country The country in which the facility is located. Facility Contact Name The name of the contact person at the facility. Facility Contact Degree The degree(s) held by the contact person at the facility. Facility Contact Phone The phone number of the contact person at the facility. Facility Contact Email The email address of the contact person at the facility. Site Status for this study * The status of the site: pending, available, frozen, or locked. The site status will be set depending on the study status. Note: This field is system-maintained and cannot be changed when the site is created. Collect Person ID? Using a person ID allows a unique identifier to be assigned to a subject, which follows the subject across all Captivate sites and studies they participate in. Required – Select this option if the collection of person ID is required. Optional – Select this option if the collection of person ID is optional. Copy From SSID – Select this option if the person ID should be copied from the study subject ID. Not Used – Select this option if person ID is not used at this site. Yes – Select Yes if the interviewer name will be collected on CRFs at the site. No – Select No if the interviewer name will not be collected on CRFs at the site. Not Used – Select Not Used if the interviewer name is not used at the site. Blank – The interviewer name field will default blank. Site users will need to type the interviewer name into the field. Pre-populated from active user – The interviewer name field will default to the current active user, but can be changed if necessary. Yes – Select Yes if the interview date should be collected on CRFs at the site. No – Select No if the interview date should not be collected on CRFs at the site. Not Used – Select Not Used if interview date is not used at the site. Blank – The interviewer date field will default blank. Site users will need to enter the interviewer date into the field. Pre-populated from Study Event – The interviewer name field will default to the current active user, but can be changed if necessary. Mark imported CRF as Completed? Captivate allows you to import Event CRF data from a file, using the web services interface, as an alternative to performing data entry. For example, when data is captured using a system other than ClinCapture. Select Yes if CRFs should be marked as complete when the data is imported from an outside system. Optionally, update the Site Event Definitions for the site which include the CRF configuration options for the site. For example if a site enters data from source documents, the CRFs may be configured for double data entry with the highest level of data monitoring, whereas other sites entering data in real-time may not be required to do so. See Managing Sites for details. Review the Site to be defined. Navigate to Tasks > Sites. All sites that have been defined for the study display. The site’s definition displays. Update the definition as necessary. Required fields are marked with an asterisk. Parent Study The name of the study currently being built. Facility Contact Email * The email address of the contact person at the facility. pending / frozen –Sites cannot enroll subjects or edit data. Data can be monitored. The Investigator cannot sign subjects’records. Queries can be updated and closed and new queries can be created. When the study status is set to Design, all sites become “pending”. When the study status is set to Frozen, all sites become “frozen”. available – All functionality is available to the sites. locked – This state is similar to pending/frozen except that creating new queries is disallowed in this state. All sites enter this state when the study status is set to Frozen. The Site Event Definitions contain the CRF configuration options for the site. These options allow you to set different CRF configurations such as hiding CRFs, double data entry, and source data verification for different sites. The site-level event definitions override the study-level definitions. That is, changing the CRF configuration at the study level will not affect a site configuration once it is created. Entire CRF — All CRF items must be monitored. Specific items – Specific CRF items must be monitored. These items must be marked for source data verification in the Manage CRFs page in ClinCapture. Check Completed to send an email when the CRF is completed. If you selected Completed, specify the email address that should receive the email. Review the Site to be updated. Click the View icon in the Actions column. From here, you can also print the CRFs for a site by clicking Print All Site CRFs. Click Back to return to the Manage Sites page. Click the Remove icon in the Actions column. Review the site to be removed. Review the site to be locked. The fifth step in completing your study build is to add users. Each user must be assigned a User Type. Further, in every study or site that a user is assigned to, he/she is also assigned a User Role that relates to the work they perform in that particular study or site. 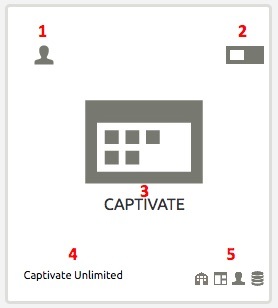 The combination of User Type and User Role determines the Captivate modules and the features a user can access. Users are assigned a user type the first time they are created, but this can be changed later. However, a user has the same user type across different studies and sites. With user type User, users have access to features related to conducting a study, such as adding Study Subjects, scheduling Study Events, and completing CRFs. However, these users cannot access the features in the Administration features group. 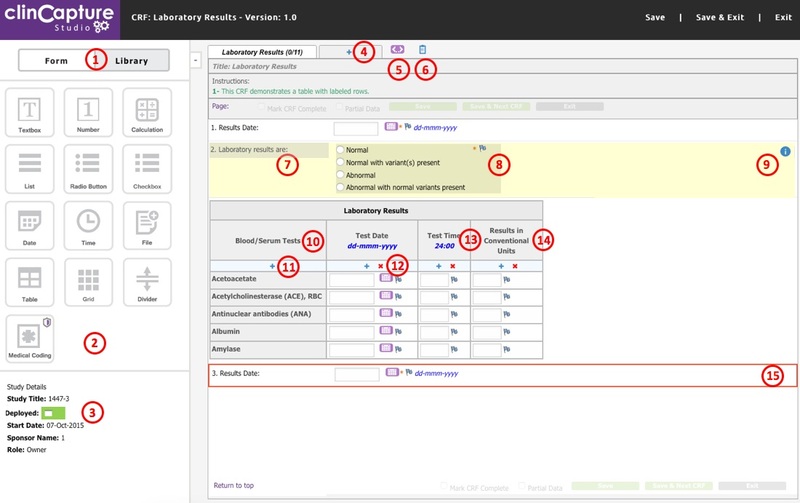 User Roles in Captivate are based on the roles typically found in clinical trials or and other forms of clinical research. 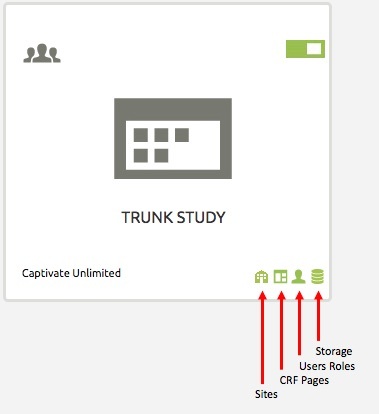 In Captivate, the User Role determines the features a user can access within a particular server, study or site. “root” is the only user with the System Administrator user role. root can create, modify, and remove a user of any user type. root can also create studies and change any system properties. This role is exclusively reserved for ClinCapture’s IT/Support department. A study level user cannot also have a site level role, within the same study. For example, a Study Administrator cannot have an Investigator role within the same study. A site level user can only perform tasks for the site(s) he or she is assigned to. A site level user cannot have a study level role, within the same study. For example, a site CRC cannot have a Study Monitor role in the same study. This table maps the user roles, the user level and the user type. As mentioned previously, the features available to a user depend on his or her user type and role. If a user does not have permission to use a feature for a specific role, then Captivate either does not present it as an option on the user interface, or disables the option on screen. View, Schedule, and Enter Data into CRFs for Events. CRFs Study level only. User Type must be “System Administrator” to remove, restore, or unlink CRFs. Study Coder or Study Evaluator Notes and Discrepancies Can create a Discrepancy Note of type ‘Query’ Can only view, update or close existing Discrepancy Note they created. To access the ‘Administration’ module, the User Type must be Administrator. Creating new studies is reserved to the root user’s role. To access the ‘Study Setup’ module, the User Type must be Administrator. However, in this module there are no restrictions based on the user’s role. To access the ‘Administration’ module, the User Type must be Administrator. However, in this module there are no restrictions based on the user’s role. The final step in completing your study build is to make it available for data entry. 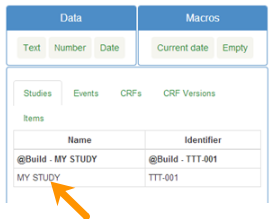 To make your @Build study available for testing, you must set the study status to Available. Select Available from the dropdown. Your @Build study is now available for testing. 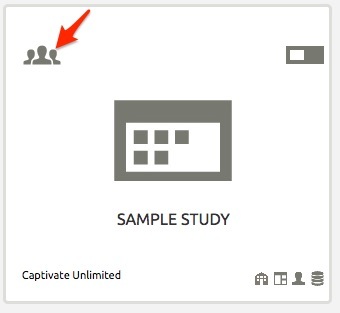 Please see Study Configuration in Captivate’s User Guide for detailed instructions on how to complete each step. From the TRAINING menu, select Training. The training curriculum and available training dates display. From the TRAINING menu, select one of the following roles: CRC, Investigator, Medical Coder, Study Monitor, Study Administrator. Learn about the training courses and schedule available for your site users. From the HELP menu, select User Guides. 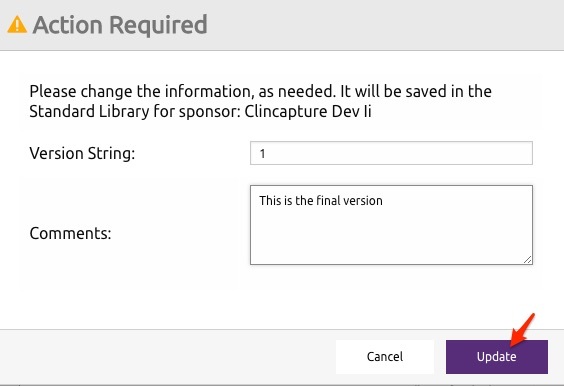 In the submenu, select Studio to open the current, most up-to-date version of the ClinCapture Studio User’s Guide. In the submenu, select Captivate to open the current, most up-to-date version of the Captivate User’s Guide. Note: You can save or print the User Guide(s) as needed. From the Account Dashboard, click Contact. Alternatively, select Contact Us from the HELP menu. Fill out the provided form and one of our team members will be in touch with you shortly. You may also call +1 (800) 987-6007. From the Account Dashboard, click FAQs.